We looked at Facebook stock—far too briefly it turns out—in 2013 when it was trading below US$30 a share. It had listed a year earlier and was in the doldrums because of what the market perceived as a ‘painful’ transition from desktop to mobile. Painful? That transition turned out to be one of the greatest business opportunities of all time. And we missed it. I haven’t looked closely in the ensuing half a decade (another big mistake). More dumb psychology at work. But lately, the company has my attention again. I don’t know if Facebook stock is cheap at 25-times forecast 2018 earnings. It could be if it continues growing rapidly, it won’t be if its moat gets eroded. Our team have just come off a nationwide roadshow, where I told a thousand Forager investors that we’re totally focused on opportunities in one of two buckets—irrational selling or informational edge. It’s hard for me to convince myself, let alone our chief investment officer and Facebaulker, that a US$500bn company is flying under the radar, or that I know something that the dozens of sell side analysts, thousands of buyside investors and millions of weekend warriors don’t also know. Anyway, I’ll give it a try. Because there are changes afoot here that are worth noting. One of them I will deal with in this post. The other—the changing nature of Instagram— I will deal with in another post next week. Judging by the headlines, Facebook has had a pretty terrible year. And it wasn’t just the headlines. The Cambridge Analytica revelations were the nadir but far from the only sleazy misuse of power. Facebook has been receiving some well-deserved scrutiny. But none of this is showing up in the numbers. Not yet anyway. 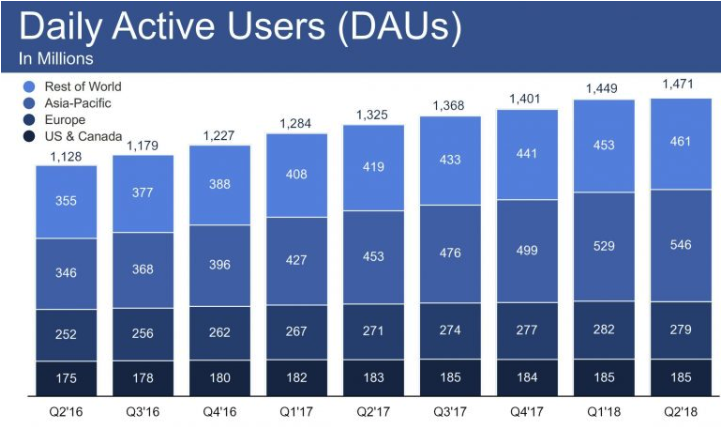 In the second quarter of 2018, users of the Facebook platform in the US & Canada were flat on the quarter and year earlier. That’s unsurprising. They are saturated markets. European numbers were down very slightly on the quarter (likely a one-off response to new privacy rules) but up for the year. Users in both Asia Pacific and Rest of the World were up nicely. In these regions Facebook has a lot more users than it has in North America and Europe. They have a lot less money, which makes them less valuable to advertisers, but they are getting richer quickly. Overall, there are nearly 1.5bn people around the world classed as a ‘Daily Active User’ of Facebook alone. That’s up 11% in a year and 1.5% from just 3 months earlier. And then there’s Facebook’s glamorous little sister Instagram, which now has more than one billion active users. Its user base had been growing at more than 50% p.a. until very recently. It is probably growing closer to 30% p.a. today. And that’s user numbers, revenue has almost certainly been growing quicker (management doesn’t separately disclose Instagram financials). So overall, the company has been growing revenues at around 50% per year in recent years, with operating profit margins approaching 50%. This—it barely warrants spelling out—is a pretty rare feat in the business world, especially for a giant company. And then with the second quarter conference call on 25 July, Facebook’s CFO David Wehner took the market’s hopes and dreams out back and shot them. In Q1 2018, revenue grew 49% versus the same period last year. In Q2, the growth rate was 42%. Wehner delivered the outlook for the rest of 2018 in CFO-speak, but suggested 33-35% might be an appropriate outlook for revenue growth in Q3, and maybe 23-26% for Q4. Brokers slashed expectations for revenue growth in 2019 and 2020 to 20-25% p.a in response. Companies can’t grow at 50% per annum for long, but that’s a dramatic brake on the rate of growth. Hardly Armageddon but a bitter pill for many FAANG fan club members nonetheless. Wehner then hosed profitability expectations too. This is a company that has been generating operating profit margins of almost 50% in recent years. Management thinks those margins might trend down towards 35% ‘over the next several years’. The stock dropped nearly 25% over the next few trading sessions. That’s a perfectly rational response in a vacuum. Where the market saw only negativity, I’m more excited by Facebook now than I was prior to July. There’s a concept in our investing toolkit that I’ve always referred to as pain today, gain tomorrow. Tom Russo calls it the capacity to suffer. Some might call it thinking long term, others time horizon arbitrage. When you see management teams actively engaging in strategies that will hurt them financially today but help them prosper years from now, take note. And that’s what is going on here. As the saying goes, except for a few billion addicted users and the myriad advertisers getting the highest return on their advertising dollars, everyone hates Facebook. It is clear that Cambridge Analytica and other scandals genuinely threaten its licence to operate. Something had to give. But listening to that recent conference call and seeing some of the changes on the ground, it is clear that the company has embraced this pain today, gain tomorrow concept. Revenue growth expectations are being ratcheted down not because the platform is losing users, nor because advertisers are no longer trying to reach them—neither of those things are happening. Rather, the company is consciously prioritising user experience over growth at all costs. They’re pushing mediums like Instagram Stories, Facebook Stories and video formats despite them being harder to ‘monetise’ in the short run. What users want—more exposure to family and friends, people of interest and less exposure to advertisers pushing an agenda unaligned with the user—is what Facebook is now promising. Less fake news, less deception, more community. Now of course, we should be sceptical. Very sceptical. But this is not an environment for the company to be making promises it doesn’t intend to deliver. Less revenue growth in exchange for a more contented (and more addicted) user base. Higher costs incurred where it’s necessary to ensure the quality and longevity of the product. A bit of respect for the privacy and desires of users. This is the right way to maximise long term value and a particularly interesting inflection point for investors like us. I’m increasingly confident that these changes will make Facebook more valuable in 10 years than it would otherwise have been. Meanwhile an antsy market, focused on the pain today, is valuing the stock at less than it did last month. Should the gap in those two trajectories further widen, you might even see Forager owning the stock one day. The chief bear case against the stock is that Facebook is your grandfather’s social media site. Kids and young adults aren’t engaging with Facebook and that will ultimately be reflected in user numbers and monetisation. Which brings us to Instagram. Today it is the little sister. In a few years’ time, it could well overshadow its older sibling. I’ll explain why next week. Top notch thoughts Gareth. Thoughts on the newly hired monitors, impeding short term margins, being replaced by AI in a couple of years? Cheers Andrew. My thoughts exactly. Lots of human power required for the new level of monitoring, and that's a big part of why the margin was guided down by management. Ultimately, a lot of this will be done by machines - meaning (all things being equal) those margins might go back up at some stage.